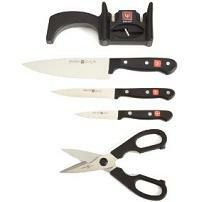 Famous German company Wüsthof has the Wüsthof Gourmet 5-Piece Essential Knife Set on sale. High carbon stainless steel knives. List price of 168$ but for a few hours today the price cut will be at 59$ + free shipping! Knives from Wusthof are rarely this cheap so don’t miss the deal; ‘check out’ and you will see the 100+$ discount. The Wusthof set includes a pull apart kitchen shear, a 6 inch cook’s knife, two stage sharpener, 3 inch paring knife and a 4 and a 1/2 inch utility knife. I can vouch for Wusthuf knives, my set has been going strong for 10+ years. High quality steel indeed. This knife set seems to look like one professional chefs would use in the kitchen. Thanks for describing what each part of the set is crafted for.